This book is about a middle-aged, professional woman who has a steamy hookup in an old chapel with a man she just met in the halls of Parliament. That description might make you think this book is a bodice-ripping romance of the Harlequin variety. Except now, both the woman and her stranger-turned-lover are on trial for murder. Knowing that detail might make you think this book is a police procedural, a story of a bad marriage and lovers desperate to be together at any cost. This is why the back of a book (or the publisher-provided description) can be misleading. It's true that Apple Tree Yard is the story of Yvonne Carmichael, a respected geneticist, and that her uncharacteristic infidelity leads to her arrest. However salacious and pulpy the premise is, however, this isn't the kind of book you'd find in mass-market paperback in an airport bookstore. 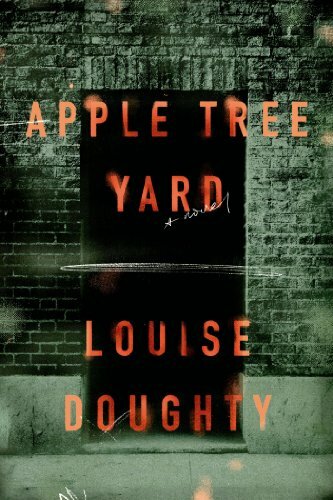 Louise Doughty writes with a refreshing amount of depth, gifting her narrator with profound insight into herself and the people she cares about. So really, the plot here takes a back seat to the measured, intentional building of Yvonne's character. This is a hard thing for authors to do well, especially when the subject matter is this titillating. Often, when an author tries to wax philosophical at the end of a crime novel, I have to look away from the page frequently in order to roll my eyes. Who wants pages and pages of introspection and speculation about motives and feelings after the trial is over and the verdict read? No one, of course—if the plot is all a book has going for it, once the action is over, so is the book. Nobody cares how the main character is feeling, for crying out loud. But again, this book is different, and I found I cared a great deal how Yvonne was feeling. Much of the narration is Yvonne speaking directly to her lover and co-defendant, asking questions and analyzing the minute details of his speech, his posture, his facial expressions. True to her scientist nature, she thinks deeply about everything. Her reflections, which in a less capable writer's hands could have been superfluous or redundant, instead make the events of her life glow with meaning. Where I was expecting a fast-paced, seedy thriller, I found a meditative, melancholy guided tour through the wreckage of a woman's life. Bottom line: Read this book instead of a romance novel or cheap mystery. Insist on getting more for your money than just a momentary diversion—demand artistry and nuance.